Kim Karr does it again. This sizzling hot second chance romance exceeded my expectations! I had “Kindle finger burn” from trying to flip through virtual pages at warp speed. I couldn’t put this one down. I was emotionally all over the place while reading this book. Toxic pulled on my heartstrings, made me want to toss my e-reader, and managed to fog up my Kindle screen. The chemistry between the characters was off the charts hot! 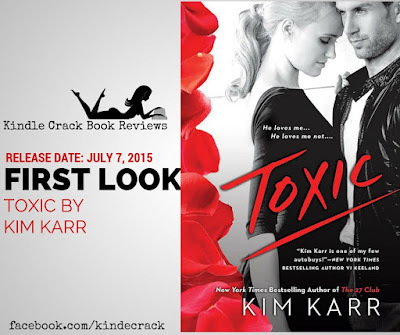 In Toxic, Kim spun a wicked and inTOXICating tale of love, lies and lust...seamlessly going from the past to present day. This second chance love story is a must read. I had to detox after I read this book in order to get rid of my book hangover. Bravo Kim Karr. Out of Time by Beth Flynn is LIVE!!! Sinfully Mine by Kendall Ryan is LIVE! Read an Excerpt From Out of Time by Beth Flynn!